We’re very happy to have Eliane Radigue at Argos. She’s coming over to attend the performance of Naldjorlak by Charles Curtis (@Argos) on Thursday 4 October, and the lecture by Manu Holterbach (@Q-O2) on Friday 5 October. A pioneer composer of electro-acoustic music, Eliane Radigue is a remarkable figure in the contemporary experimental music scene. As soon as the early 50s, she was closely related to Pierre Schaeffer and Pierre Henry. From 1970, she started distinguishing herself from other composers by focusing on the new possibilities offered by the first synthesizers. 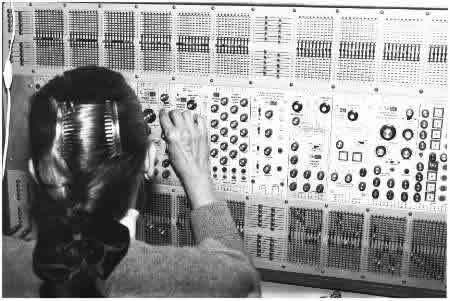 More particularly, she worked with an ARP synthesizer, which became and remains her trademark. Her drone music, a continuous flow of intermingled sound waves, is impossible to ignore and is a major influence to a whole new generation of composers – in France as well as in many other countries. concert Charles Curtis (cello): ‘Naldjorlak’, a composition by Eliane Radigue for Charles Curtis. in the presence of Eliane Radigue .